Photo: Clean graffiti in Surf City. Credit: Trone Brand Energy Inc.
Surf City is a community that straddles the mainland and beach near Topsail Island. It is a popular destination in warmer months when its permanent population of around 2,500 can grow to around 10 times that size. Visitors and residents alike walk and bike in the city and around 8% of trips to work are on foot or by bicycle. 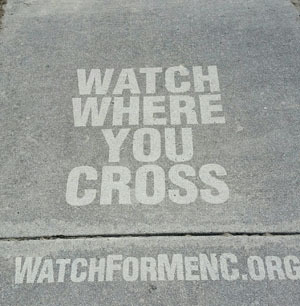 The Town of Surf City joined the Watch for Me NC program as part its commitment to create a safe environment for all road users. The Town of Surf City has partnered with the Surf City Police, Fire, and Parks and Recreation Departments, Pender County Schools, Pender County Parks and Recreation, Pender County EMS and Fire, Pender County Board of Commissioners, and the Cape Fear Rural Planning Organization. Surf City has also worked closely with realty companies that manage many of the town’s large number of rental properties. Surf City has successfully collaborated with local property rental companies to place Watch for Me NC materials in all rental packets. Rental companies were happy to help and asked if they could make copies of the materials to continue distributing them to the town’s thousands of visitors. Surf City has also sought to raise awareness through Facebook, marketing banners, and distributing materials to businesses and a local community center. Watch for Me NC has inspired program organizers to engage with new partners, such as rental property agencies. Organizers learned that these agencies held a latent desire to participate in a program like Watch for Me NC and readily volunteered to help spread campaign messaging. The town discovered synergies between developing a bicycle-pedestrian master plan and conducting Watch for Me NC outreach. Each complemented the other in terms of interacting with people to discuss road user safety. It is beneficial to involve local law enforcement from the very beginning. Regarding outreach locations, the local farmer’s market worked well for engaging people and having Watch for Me NC conversations about road user safety. The farmer’s market was also a place where program organizers could interact with residents and visitors alike. Finally, social media has proven to be an effective way to spread messaging quickly and to younger audiences. Thanks to Lieutenant Phillip Vorhees of the Surf City Police Department and to Todd Rademacher of the Surf City Planning Department for their work on the Watch for Me NC program and for the information provided for this community profile.